This cake portion guide is exactly what you need if you’re making a cake for an event or a wedding. While the cake flavor and decoration are important components of a cake, one of the most fundamental aspects of a cake is its size! When making a cake from scratch for an important event, it’s crucial that it has the right number of servings. You want make sure every guest gets a slice. That’s where this cake portion guide comes into play. What Is Considered A Serving Of Cake?? Throughout this post I refer to a serving of cake. Generally, I mean a slice of cake that is 4 inches tall, 1 inch wide, and 2 inches in length. This is the standard size of a slice of wedding cake. This post isn’t just about wedding cakes though. It’s also for cakes to be served at parties or events. Strangely enough, the size of a cake serving for a wedding is smaller than a party cake serving! Cakes cut for parties are normally 1.5 inches wide. While this is a small difference in size, it’s important to note that a slice of cake at a party is bigger. This can impact the number of servings included below. To be consistent, I’m going to be referring to wedding cake portions throughout this post. The standard size of a cake slice is definitely the golden standard. However, my vanilla cake recipe makes a 7 inch layer cake that is way taller than 4 inches. In general, tall layer cakes have increased in popularity and are quite common nowadays. This can make cutting and serving a cake a lot more challenging. The height of a cake can be influenced by a lot of factors. 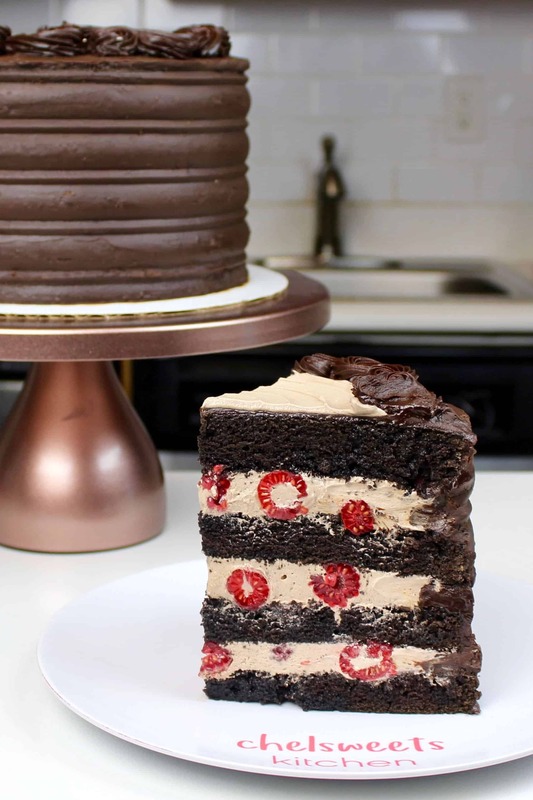 It’s based on the number of cake layers used, the height of the cake layers, and the amount of buttercream between each layer. If I make a cake taller than 7 inches, I cut it into thin slices (about 1 inch wide). Then I cut each slice in half, horizontally. This means that out of each slice I make, I create 2 servings. For tall cakes, I double the servings shown below, since those are based on a shorter cake (4 inches). 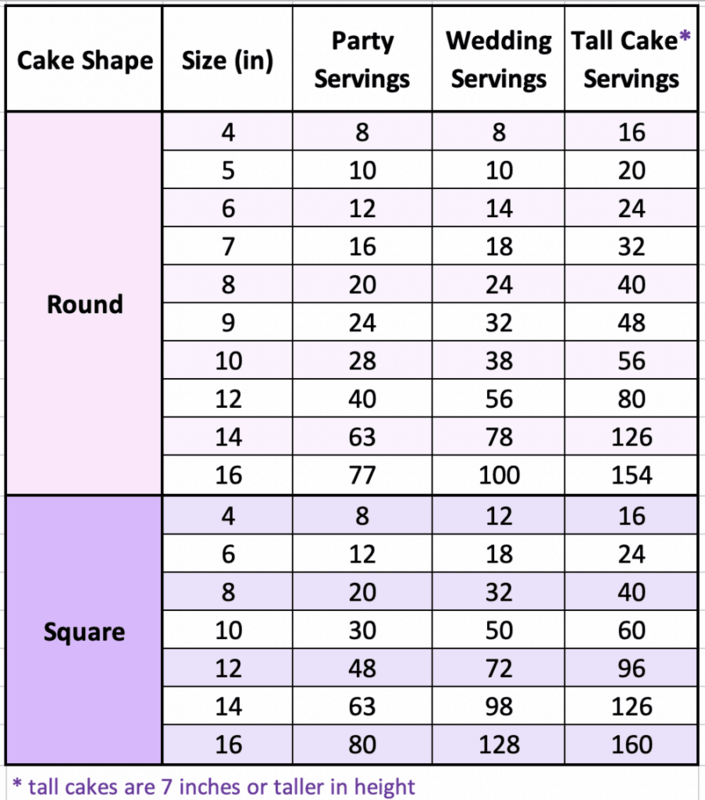 When trying to determine the right size of cake to make based on the numbers below, please refer to the far right column. Once you know the number of servings you need, you can start to think about what size of cake you should make. If you don’t plan to make a tiered cake, things are quite a bit easier. A single-tiered layer cake has set number of servings. However, this can vary based on the shape of the cake. For example, a square 8 inch cake will have more servings than a round 8 inch cake. If you want to make a cake that is a different shape, Wilton has a great chart that shares the serving sizes of a variety of shaped cakes. 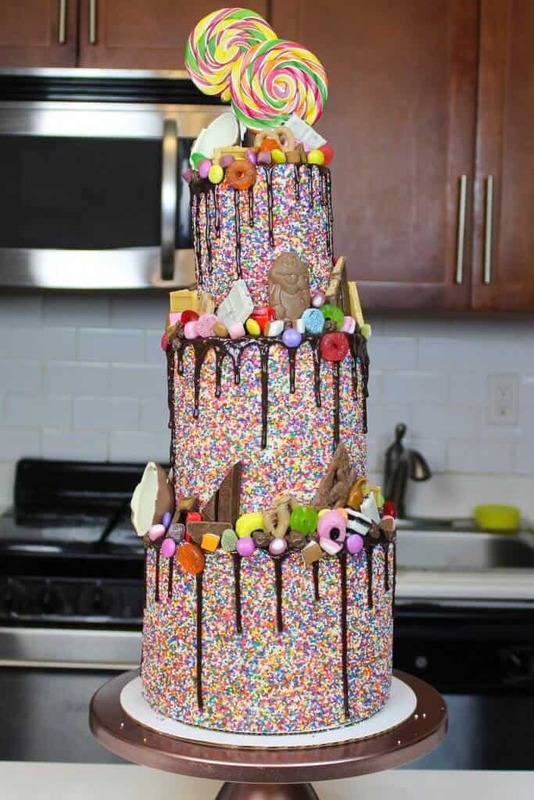 If you need to feed a large number of people, you may need to make a tiered cake. Tiered cakes have a lot more variety and flexibility in their number of servings. Different sized tiers vary in serving size, and you can combine them in a ton of ways. In the past, I’ve made a tiered cake with 10 inch, 8 inch, 6 inch, and 4 inch tiers that fed 84 people. I’ve also made a cake with 12 inch, 9 inch, and 6 inch tiers that fed 100 people. While part of picking the right size of cake comes down to having the right number of servings, it sadly isn’t that simple. This decision can also be influenced by the look you’re after. 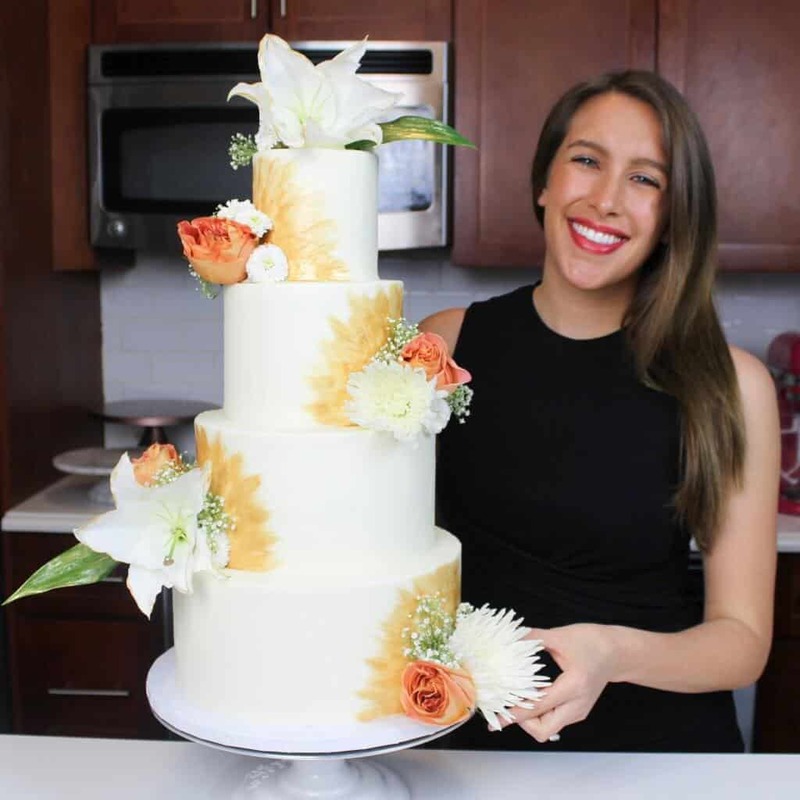 Some people want a specific number of tiers, or a cake design that requires extra space between each tier to add decorations. For example, sometimes I add fresh flowers to my tiered wedding cakes. When doing this, I like to have at least a 3-inch variance in my tiers (i.e. 12 inch, 9 inch, 6 inch). This creates a 1.5 inch ledge between the tiers, which leaves me enough room to position and secure the flowers onto the cake. To figure out what size of tiers you should use for a big event or wedding, I highly recommend reviewing a cake portion guide, like this! 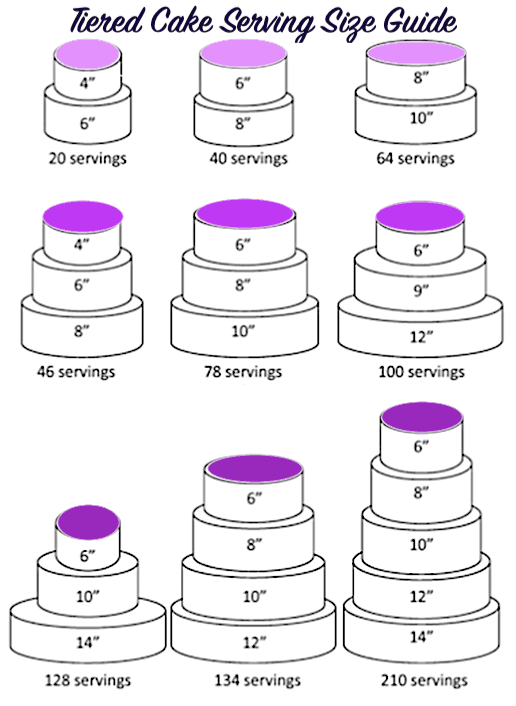 It shares the number of servings of different sized tiered cakes. This cake portion guide also shows combinations of different sized tiers, which is extremely helpful. It’ll help you see what options you have for however many people you need to feed. This will also help you determine what makes the most sense with the cake design you plan to make. Keep in mind there are tons of other options for tiered cakes that aren’t included here, so don’t feel limited by this chart! 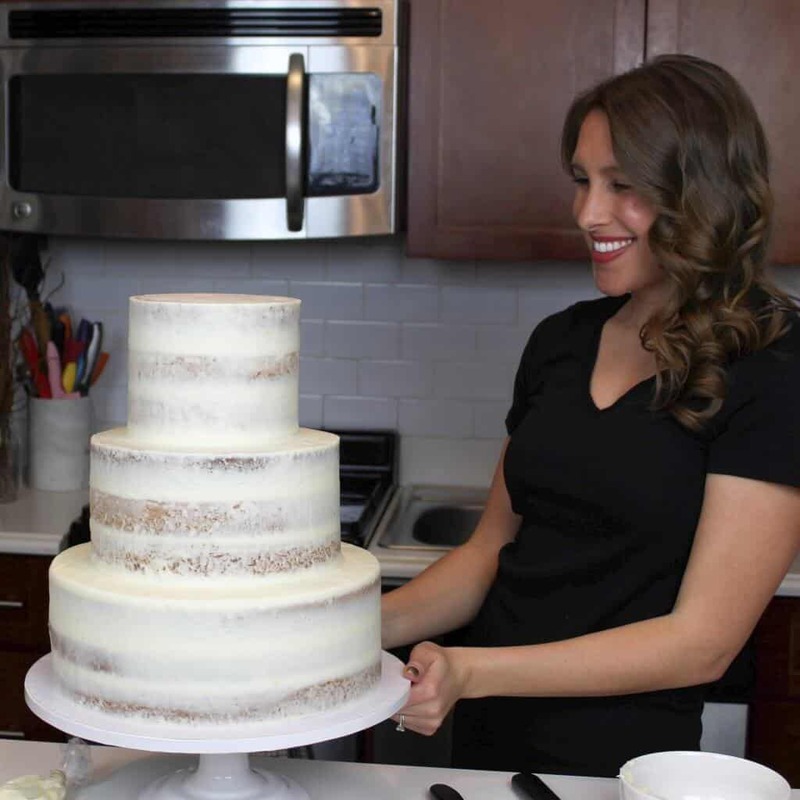 These are simply the most common sized tiered cakes. If you have any questions about cake portions or servings that I didn’t answer in this post, please ask me in the comments section below. Your cakes are beautiful you are amazing thank you for the cake chart but still don’t know how to measure the batter how many cups of batter would I need for example for two 9 inch cakes or four 6 inch cakes ????? I’m working on adding that in, I promise! I usually calculate the amount of batter I need based on the volume of the layer in cubic inches, rather than cups of batter. I’m working on creating another guide to help with that 🙂 stay tuned!! I saw your video and I loved how you made it easy, simple and elegant. My only problem is how to calculate the batter for the cake ?!!!! I really struggle with this step. For example , for 8” pan you need 4cups if batter, how do I do it ? Is there is a certain ratio of the egg:butter: flour?! Please let me know how as I don’t want to use cake boxes. My son birthday is coming soon and I’m planning to do 3tier cake. Please let me know the exact amount of batter do I need . Thanks. Thank you so much for this!!! It’s such a huge help! Love your work so much! I’ve been watching your videos for so long and you’ve inspired me to start making cakes and now I’m OBSESSED!! Just watched your Awesome YouTube video that included instruction to level your cakes. I found that leveling cakes this way is great if you plan to make cake balls!? Yum! But if not, I’ve found this wonderful method for beautifully baked cake layers!!! The reason cakes dome is because the outside edges of the cake cook faster than the center causing the cake to bulge in the middle as it bakes. As you stated in the video, using a nail helps to direct heat to the center of the cake, which is very important! But to achieve a perfectly baked cake every time it’s equally important to wrap your cake pans! It’s a bit more time consuming, but so very worth the effort! Wrapping the cake pan enables the cake to cook evenly around the edges all the way to the center eliminating overcooked edges and domes. No Trimming necessary! There’s no waste…PERFECT cakes everytime! DO THIS BEFORE PREPARING THE INSIDE OF YOUR CAKE PAN! ? 1) Using a flexible measuring tape, measure the circumference of the cake pan you’re using. 2) Tear a length of paper towel equal to the length of the circumference. 3) Tear off a length of foil to match the circumference PLUS 5″. 4) Lay the foil out on a flat surface. 5) Fold the paper towel length-wise to a thickness equal to the height of your cake pan. If you’re using a 2″ tall pan you’ll want to fold it 2″ wide or 3″ wide for a 3″ tall pan. 6) Now dampen the folded paper towel thoroughly. Gently wring out any excess moisture, you don’t want it dripping wet. 7) Place the folded paper towel on the sheet of foil centering the towel so the ends of the foil can be flattened. Fold the foil around the paper towel forming a long strip. 8) Wrap the foil around your cake pan, then fold the flattened ends together and crimp the foil to hold it securely around the cake pan. If it slides up and down slightly that’s okay, your cake will still bake perfectly. I reuse these strips several times. Just gently unfold the foil and re-dampen the paper towel before reusing. Hope this is helpful! Happy Baking! The chart with the taller cakes was very helpful. Thanks for doing that!